"It is our objective to make students fit for transferring the acquired knowledge of precast concrete construction to the offices," states Prof. Dominik Wirtgen of Frankfurt University of Applied Sciences (UAS). Since last year, he and Prof. Jean Heemskerk have included planning and construction with precast concrete elements in the undergraduate bachelor program of their faculty of civil engineering. At least 17 of the faculty's overall 60 bachelor theses dealt with this topic in the 2016/2017 winter semester. At the end of the semester, bachelor theses were awarded with two now sponsorship prizes for the first time - one is sponsored by the Trade Association of German Precast Construction (FDB - Fachvereinigung Deutscher Betonfertigteilbau) and one by Heidelberg Cement AG. Wirtgen launched the idea of the sponsorship prize together with the FDB general manager, Dipl.-Ing. Dipl.-Wirtsch.-Ing. Elisabeth Hierlein, last year. FDB endowed their sponsorship prize with 500 euros for the best bachelor thesis with the subject-matter on construction with precast concrete elements. In her thesis one student assessed and compared three different types of construction - curtain wall panel, sandwich façade, and fiber-cement panel - according to the production and construction costs, with partially using DGNB criteria and indices of construction costs as a basis. Another thesis adopted theoretical approaches to architecture, which means philosophical ideas, in order to get a grip on the structural design. Specifically, it was about the term of transparency according to Colin Rowe, that is to say a strategy of how to reduce a building's proportion of glass de facto, however retaining the character of transparency. However, the FDB jury awarded the building of Jochen Sauer, who developed two sandwich façade in his design, one for the side of the street and one for the courtyard. His structural solution must be described as unconventional. He turned the typically M-shaped modular façade elements by 90° and added the resulting E-shaped modular elements logically together. The jury, in particular, appreciated the very detailed design which even considered the reinforcement, thus documenting an overall profound understanding of precast concrete construction. This thesis is something very special for Prof. Wirtgen, because it is just a bachelor thesis and not a master thesis. He attests that this is really buildable. 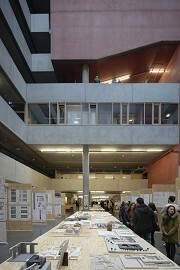 The fellow students of Sauer were also very impressed by his thesis and awarded him with the prize of the students. Because, this semester the students of the faculty of architecture also awarded a prize, with the support of the German Architecture Museum (DAM - Deutsches Architektur Museum) in Frankfurt, for the best of all 60 bachelor theses in their opinion. Tabea Wodsack was awarded by Heidelberg Cement AG with the "Innovation Concrete Prize" ("Innovation Betonpreis"), worth 500 euros as well, for the most detailed and most comprehensive understanding regarding planning and construction with concrete. Just as her fellow student mentioned above, she had compared several construction methods using concrete and assessed them in terms of efficiency - this time, sandwich, fiber-reinforced concrete, curtain-type precast elements and insulating concrete. She, furthermore, elaborated all four construction methods up to the detailed design. In addition, she took into consideration that the supporting structure had to be adjusted if the cross-sections increase and the load-bearing capacity is progressively restricted, in case of dimensioning in accordance with the German Energy Savings Ordinance (EnEV). 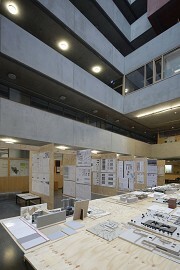 The resulting extra costs and the changing building physics were also taken into consideration in her thesis. She exactly proved that a size 60 wall has to be used in order to comply with EnEV if using insulating concrete. But in this case the wall density would be so bad that a self-supporting façade had to be changed to a supporting structure and therefore she did not recommend this construction method for this purpose.